Currently I am looking out at the record March snowfall in Calgary as I sit down to write some of the big ticket items our farm, Happiness By The Acre, has undertaken to tackle climate change. This bounty of moisture is almost enough to make one forget the last two years of drought on our land near Carstairs and the increase in extreme weather we’ve seen over the last decade or so. Every year it feels like the weather is more boom or bust, our on farm data collecting and that from Environment Canada agree. Things are changing. We are new to farming, this is my second career change, so we come to the land with a new and fresh relationship. Our faith moves us to a stewardship ethic, and to care for the gifts of land and life we have taken responsibility for. That forces us to take on both short and long term viewpoints when we approach farm practices; and both of those are greatly impacted by a changing climate. 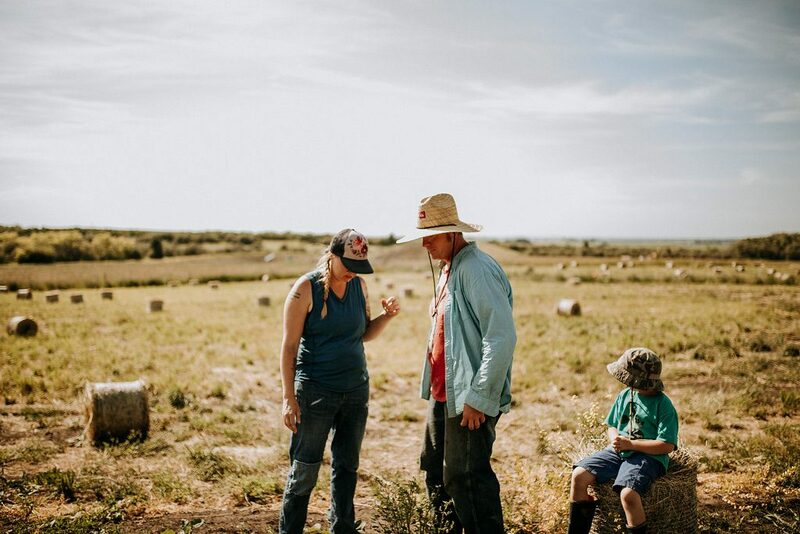 At the end of the day we have found that tackling climate change on the farm and doing business in agriculture, stewardship in good faith, and learning the art and craft of farming has been less about compromise and more about critical survival. We took over land that has a mixture of riparian, treed, and crop land that had been low/no tillage farmed in wheat/canola/pulse rotations in a conventional manner. The soil was showing moderate to high compaction, had low organic matter (0.5% +/- 0.25%), and there were early signs of agrochemical runoff issues in our riparian areas (low numbers of amphibians). The first move we made was to protect our riparian and treed areas. Through a partnership with our country and Agriculture Alberta we fenced out these areas of our land to protect them from future grazing and tillage. We have the option to come in and graze for fire control and managed disturbance, but largely are leaving these spaces as wildlife habitat and water filtration zones for our greater watershed. In a climate like Alberta where water is our number one limiting factor for farming we felt it critical to protect systems retaining water near our property as well as aid our neighbors downstream with cleaner more stable water supplies. Wetlands hold water in times of bounty, and slowly release them in times of drought. We felt that being good stewards and neighbours preserving our wetland areas was critical. The fencing systems we use are a high-tensile electrified system pioneered by a local business, Green Edge Precision Fencing, that allows easy wildlife movement through our property, which is important for local and regional biodiversity. The more local biodiversity we support the more long term stability in the regional ecosystem. This pays us back in lower pest numbers, fewer livestock losses as prey species are available for predators, and an improved aesthetic landscape which helps us with our agritourism business components. The deer and moose that visit our pastures make for a wonderful tourist draw. We leveraged grant money to recover install costs through both county and provincial programs. Most of our efforts to date have focused on increasing organic matter content in the soil. Organic matter (OM) is critical to the soil ecosystem and the health of our land, binds atmospheric carbon, feeds bacterial/fungal soil networks, and retains water. OM also loosens the soil making root penetration easier, and crop health depends on deep roots in our dry boom-or-bust rainfall patterns. Since we practice a beyond organic farming methodology OM is huge for our farm. In our trial areas we have taken the OM count from 0.5% as the low to 2.0% as the high in 3 years. We did this largely through a chop-and-drop methodology where we mowed pioneer species (weeds) and self seeded clovers and grasses twice a season. These areas can now be grazed lightly, and we have planted orchard crops throughout for future production. Unfortunately our orchard trials are struggling under browse and thistle pressure, but we are very happy with the results in the soil and are looking to start grazing the area with sheep or goats for revenue and thistle control. In our market gardens we use rotations of cover crops, chop-and-drop, low tillage, and periodic rotary ploughing to break up hard soils and incorporate OM into deeper soil strata. In these areas we have seen the soil texture and organic matter counts radically improve; which has made for easier weeding, harvests, and seeding. In 2016 we began the process of converting the majority of our property from annual cropping into a perennial pasture, reseeding 130 acres to a mixture of 5 grasses, 3 alfalfas, and vetch. We have lots of volunteer clovers; red, white, and trefoil already on the property. Again, we feel that a high biodiversity in our pastures is critical as some plant varieties thrive in drought, some in colder years, some in wetter years. This will over time let us maximize our productivity and ensure a constant cover over the soil. Even with 2016 and 2017 being very dry seasons we were able to take the field for silage in 2017, and timed that with flower emergence on our biggest pest weed, Canada Thistle, as a passive control measure. This season, 2018, will see us beginning to use holistic planned grazing to harvest the pasture with custom grazed cow-calf pairs and small scale pastured poultry. Holistic planned grazing (sometimes called Mob or Mig) is a fantastic way to build soil health and pasture health, converting all that pasture into high demand meat. All it takes is some portable infrastructure. We have cross-fenced with this in mind, as well as placed a solar powered irrigation system with portable waterers to give us highly flexible and modular paddock control with minimal permanent fencing. The entire farm is planned out using holistic planning and keyline methodologies; basically we lay everything out based on how water flows across our land and how wind moves snow in the winter to maximize on farm water retention and aesthetic beauty. We are planning a major installation of shelterbelts in 2019, including food and medicinal plant species, to mitigate drying winds, add crop diversity, and to increase snow catch. We have also installed a large dugout with the capacity for a 2 year drought supply of water to help mitigate changing rain and snowfall patterns, and may install a second smaller dugout in the future. Our buildings are planned around net-zero methodologies and low impact/low energy operations, and we are in the early stages of planning a PV solar micro-generator between 20 and 30 kw in size. This will power our entire farm and provide extra income by selling energy into the grid through the Alberta Energy Cooperative. Our farm can be found between Carstairs and Didsbury, and we welcome visitors. The summer of 2018 will see us opening a trust based on-farm store selling local food, artisan crafts, and our products. Look for events at Happiness By The Acre on our Instagram feed or join our newsletter. Marcus Riedner – Happiness by the Acre.